Fallout 4 Fat Man Scale Replica - Fallout Loot Crate Exclusive - New. The condition is New. MOTIVE: BATMAN ARKHAM KNIGHT. 35.5 x 18.5 x 12. The simple push fixes the problem. - perfect for a gift as well as for every collector and fan. - vehicle mounted on the base (possibility of dismounting the vehicle from the base). SKYLANDERS Bundle of Figures, Everything included in photos. Some figures do show signs of wear and tear, a few damaged. 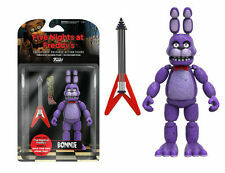 Collect the Nightmare versions of Freddy, Foxy, Chica, and Bonnie with this Five Nights at Freddy's Collectible Vinyl Figure Set from Funko. Each of these figures measures approximately two inches tall, and they are packaged together in a window display box. 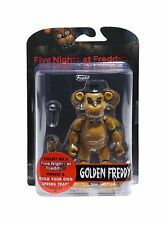 Bring home all four of the Five Nights at Freddy's: Four Packs from Funko today!. Totaku - CONKER from Conker's Bad Fur Day - New in Packaging - RARE!! Characteristics of the TOTAKU Collection. Size: 10 cm. Totaku - BANJO-KAZOOIE - New in Packaging - RARE!! Doll(approx. 30cm tall). in Original BOX(Never Opened). As a rule, NECA’s sculpts are genuinely excellent and this big guy is no exception. Manufactured by NECA. Highly Collectable. Heh, see what I did there?. He has nails in his head. Ahem… moving on. Even his Big & Tall Wranglers, which are mostly covered by his smock, are really nicely detailed. Boxed Call of Duty COD Modern Warfare 2. This is a used item in very good condition, this has been displayed in a cabinet since new, however there is a defect on it there's a red mark on the foot and near it, it's been there since I've owned it, this is pictured, there maybe light marks but not that I can see from the naked eye. Ubisoft presents the second group of operatives from the official collection of Six Collection! Tibi Marius Streicher (Jäger) - operative of the defense group from the German joint venture GSG 9. Expansion of the popular collection Six Collection. Material: High quality PVC. We will do our best. New listingPair of Horizon Zero Dawn Totaku Figures - WATCHER & ALOY - NEW in Packaging!! Cosmic Gifts have been established for over 25 years. Providing new and unique gift solutions for any event. WALLETS AND PURSES. Choking hazard, small parts. Suitable for children 3 . Includes accessories. Mass effect andromeda nomad ND1 remote control car with steel book case for game (Game not included) In great condition used once or twice mainly been on display. Connects to most phones or tablets with apps to drive and also has a camera on the front that you can see while driving and record videos. Complete with box and instructions and USB charging cable. Check out my other items. Disney Infinity Bundle of Figures, Everything included in photos. Some figures do show signs of wear and tear, a few damaged or Marked. (Check out his rich detail and iconic pose. It is not intended as a toy or children’s product.). You'll hear back from us within 24 hours. We will be happy to help. Totaku - Dark Souls ARTORIAS Figure - New in Packaging - RARE!! Square Enix's Play Arts [KAI] label, possess improved articulation, more accessories and slightly larger sizes than their Play Arts predecessor. His desire to preserve the life of his team mates lead to his death in the Halo Reach title, sacrificing himself as part of a diversion. World Of Nintendo Sheik Figure NEW & SEALED Legend Of Zelda Ocarina of Time Rare. Condition is New. Dispatched with Royal Mail 2nd Class. Outfitted in a state of the art combat Nanosuit that gives him superhuman strength, stealth and agility. The military operative known only as Alcatraz is a one man army bent on accomplishing his mission objectives a\t any cost - bravely devoted to Duty in the face of overwhelming odds. YAGYU JUBEI ONIMUSHA 2: SAMURAI'S DESTINY Mcfarlane/Capcom 15cm Figure Unopened. Sold as New and Unopened Condition. Near MINT - We also rarely use this grade unless the item is in exceptional condition for it's age. This is UK Law. Item will have been well played with/used. Item will have been used. A must have for all fans of Lost Planet and high-octane adventure. And for now that is it. All as follows and are all NECA. 14" Columbia Statue Limited edition 666/1000 Boxed New. Subject Delta ( Sealed ). Big Daddy ( Sealed ). Big Daddy Light Up ( Sealed ). Big Daddy Elite ( Sealed ). Pair of Horizon Zero Dawn Totaku Figures - WATCHER & ALOY - NEW in Packaging! !